I read that wearing good quality shoes is key to pulling together an outfit. My daily footwear of choice is the Old Navy flip flop. What’s not to love? They usually cost less than a cup of the Bucks and if you add up the cost per wear, they are practically free. On a side note, have you heard of this Cost Per Wear nonsense? Experts basically say if a pair of jeans costs $60 and you wear them twice a week for a year, then they really cost you $2.50, or something like that. Well, if I buy a pair of flip flops for $5 and I wear them 180 days a year then they really only cost me 27 cents! Which is a hell of a lot cheaper than $2.50! Regardless, I kind of get it, I just know that if I also spend $100 on a quality piece of clothing, I also have to eat a little less for one month and sacrifice a margarita at my favorite Mexican neighborhood joint. A fabulous selection of Old Navy flip flops in grey, red, green and some old flops with a shiny thong. A pair of blue shoes purchased off the Coach sale rack. The fabulous Badgley Mischka blue shoes that I wore for my wedding, that I don’t know if I’ll ever wear again, and the very first pair I purchased after I lost everything in Hurricane Katrina. Yes, before a pair of flip flops or tennis shoes, I bought these. And then a variety of black ballet flats, wedges, and ankle boots. See, I have good things, just not GREAT things! 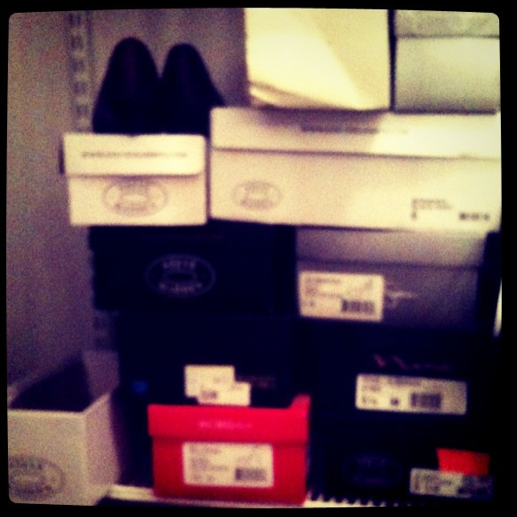 I’d like to take a look at what a well-stocked shoe closet should consist of and what I seem to be missing. After reading countless blogs on The Top 5, 6, 8, 10 Shoes Every Woman Should Own, I have compiled a list. Ballet Flats. In black of course, and then a neutral and one trendy, like a leopard print or something. I don’t know! Brown Hue Thong Sandal. I went on a mission to my local DSW to find this. I tried on at least 20 pairs and didn’t love the way I looked in any of them. I walked away with a pair of white low-rise Converse All-Star shoestring-less shoes that I have yet to wear. 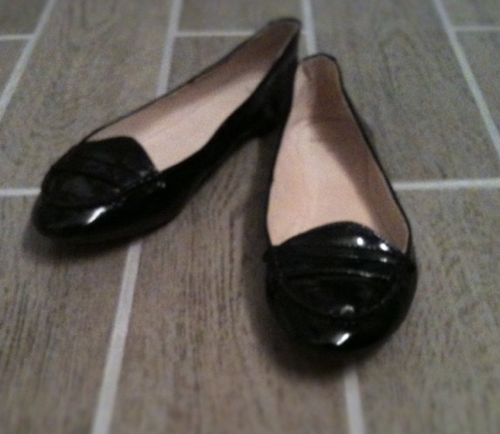 Classic Black Pump – pointed or round. I think I have this. It’s got a peep-toe. I don’t love it, but it’s comfortable. I’d love a pair of Louboutin’s. Tall Stiletto Boot. I have these too. They are more cowboy on the top and super uncomfortable. I almost threw them out because I didn’t wear them once last year but I decided to hang onto them one more year. Kitten Heels. I have never been a fan of these. I may have a pair of brown ones that qualify as kitten heels but they are so loud, you can hear me coming from a mile away. All Weather Boots/Uggs. I’ve never felt the need for these but I always regret that I don’t have them when it’s freezing cold in Atlanta. I’m from the deep south of New Orleans and I still have a hard time accepting winter. Ankle Boots. I purchased my first pair last winter and I really do love these. I find they go better with skirts. Okay, so that’s the list. Whew, I know women have a sickness when it comes to shoes but this is a lot to digest. I know baby steps are in order because we haven’t even covered the 5 types of handbags every woman should own, or the massive amounts of accessories. Hmmmmm….Stuff to think about.